Small volumes of anti-RPS8 antibody vial(s) may occasionally become entrapped in the seal of the product vial during shipment and storage. If necessary, briefly centrifuge the vial on a tabletop centrifuge to dislodge any liquid in the container`s cap. Certain products may require to ship with dry ice and additional dry ice fee may apply. Subunit Structure: Identified in a IGF2BP1-dependent mRNP granule complex containing untranslated mRNAs. Similarity: Belongs to the eukaryotic ribosomal protein eS8 family. 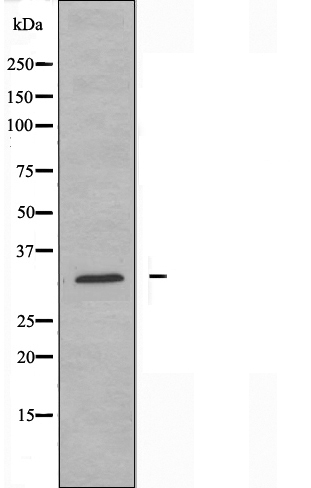 Western blot analysis of extracts from 293 cells using RPS8 antibody. 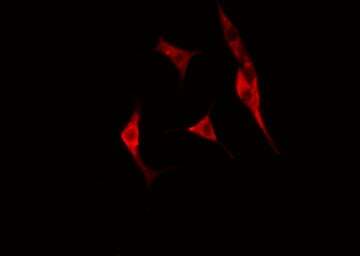 MBS9605145 staining A549 cells by IF/ICC. The sample were fixed with PFA and permeabilized in 0.1% Triton X-100, then blocked in 10% serum for 45 minutes at 25 degree C. The primary antibody was diluted at 1/200 and incubated with the sample for 1 hour at 37 degree C. An Alexa Fluor 594 conjugated goat anti-rabbit IgG (H+L) antibody, diluted at 1/600, was used as secondary antibody. NCBI/Uniprot data below describe general gene information for RPS8. It may not necessarily be applicable to this product. 1. RPS8, a member of the small subunit ribosome, was identified as an interacting partner of CDK11p46.